Prosecute Officer Fields. Drop charges against Spring Valley students. After nearly 90,000 ColorOfChange members raised their voices, Richland County Sheriff Leon Lott fired Officer Ben Fields, but he is not facing any criminal charges. As of right now, the only people facing charges are the young students Fields brutalized. It's inexcusable. Fields — who has a long history of violence targeting Black students and Richland residents — should never be a police officer again, but he must be charged with a crime in order to lose his license. Join us in urging Richland County Solicitor Dan Johnson to drop the charges against all students and charge Officer Fields with assault. This is the letter we'll send to Richland County officials on your behalf. Feel free to add a personal comment in the space provided. I urge you to charge Officer Ben Fields with assault and to drop all charges against the students he brutalized. While the federal government is investigating, videos of the attack provide more than enough evidence that Fields committed a crime. Additionally, officer Fields has a history of attacking and intimidating students and other citizens, and he is currently facing a lawsuit from a student who says he unfairly targets Black students with allegations of gang activity. 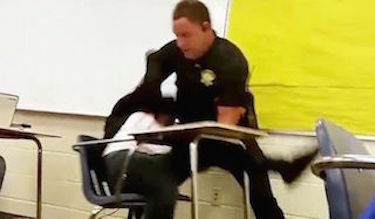 A student having their cell phone in class is not a crime, and neither is filming the police. The only crime committed that day was by Officer Fields who assaulted a child. As the Richland County Solicitor I urge you to bring Officer Fields to justice and protect, not criminalize, his victims.